One of these days, the fancy bike rack in front of the store will again be of practical use. Every few days, Google Mail brings a question like this one on Thursday: “Do you know the status of the grocery store that is supposed to come to North Albany Village? Is it still coming?” As far as I can tell the answer is yes, but the process is slow. 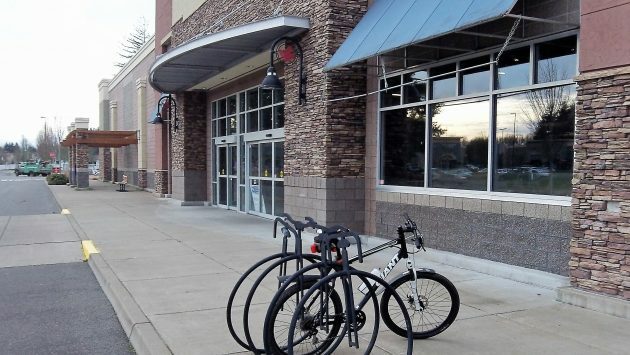 Another definite step has been taken, though: The Albany building division has issued a building permit for interior renovations to convert the former and long-vacant Ray’s supermarket at the North Albany Village shopping center into a grocery for The Myers Group, based in Washington state. Novak Architecture of Portland had filed for the building permit at the end of June. The city’s website says it’s for work amounting to about $300,000 in value. The permit was pending until, on July 18, building inspector Joel Heenan asked for corrections in the plans. Great news! Thanks, Hasso! It will be sooooo good to have that store open. We have all waited a long, long time!! They were working inside this morning. A grocery store in North Albany, NA for short in headlines.